In my final academic year in Diagnostic Radiography we are encouraged to take an elective abroad. I decided to go to India for 3 weeks with the hope of seeing how the culture, funding and general standards differed to the hospital I trained in. I also wanted to experience healthcare done in a different way to see if there was anything I could take back which developed my practice. I certainly can say it was an eye-opening experience . I met so many nice people and seen things I would never have seen back in the UK. I went with 2 other students from my university. I chose Global Medical Projects over a couple of other organisations because I had read nothing but positive reviews. Also the pricing is much more affordable and quite frankly better value for money. I gave Kevin a ring who settled a few things for me before I went. I have Celiac disease which means I can’t have anything with (Gluten) wheat, barley or Rye in, I have to take measures to prevent any possible cross contamination as it can make me very ill. Well Kevin did all he could to find out whether I could be accommodated at the hosts house, which I am very thankful for. Once I made my booking an account was setup on the projects webpage which provided lots of valuable information such as things to do in and around the area, information on the currency and most importantly the visa information. This was invaluable as you will probably require a visa for India. 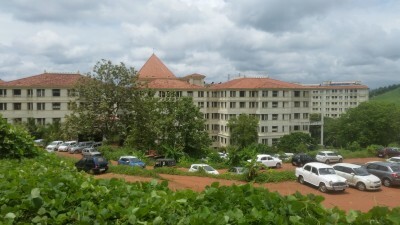 My placement hospital was at Sree Gokulam medical hospital in Venjaramoodu which is just outside Trivandrum. The hosts house was literally a 3 minute drive away which was convenient. On the first day we were introduced to everybody involved with students in the hospital. We were given a tour of the hospital which was absolutely huge! I got the opportunity to see many procedures not commonly performed in the UK such as IVP’s and many contrast enhanced studies. There are 2 CT scanners, one is a state of the art 128 slice CT scanner. There is one Siemens 1.5T MRI which was kept busy most days. 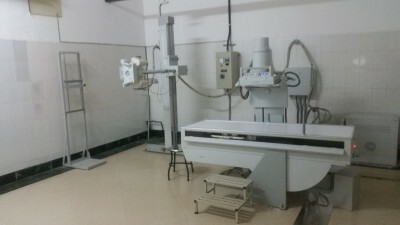 There are also 2 ultrasound rooms with a constant work flow. All the staff were very welcoming and friendly and are keen to learn what they can from you. When I arrived in Trivandrum I was met on time at the airport and given a local sim card to communicate with people when needed. I was taken to the door step of my host (Babu) who met with a cup of chai tea. The house is great, there are actually two, one across the road from the other. You feel as so you are in the middle of the jungle. There are banana, mango, jacksfruit and coconuts growing literally on your door step. The host is called Babu he is a genuine, hard working guy. Always has a smile on his face and will do anything for you, very accommodating. You are made to feel at home from the second you walk through the door. The food provided in the house was really good, not once did I get glutened! Breakfast, snacks and dinner was provided. Lunch was usually at the hospital. My room had an ensuite shower/toilet. Generally there are three beds to a room, with males and females separated, the rooms were spacious, there were fans to keep you cool and the beds were pretty comfortable as well. The house is well kept and is clean. The toilets in the house and some in the hospital are western style. There is wifi available throughout the house. The best part of the house is the balcony on the first floor and the roof terrace, the views of the canopy are nice and it is a nice place to socialise with others in the house after work. Babu the host was there every step of the way, if you needed anything from the shop he would grab it for you, he would take you to work in the morning and pick you up from work. Babu seems to know everyone and has contacts all over the place, he was able to arrange transport for us, recommend us hotels and places to go eat and sites to go see. There was always someone in the house if you needed them. Kerala is a site to behold! 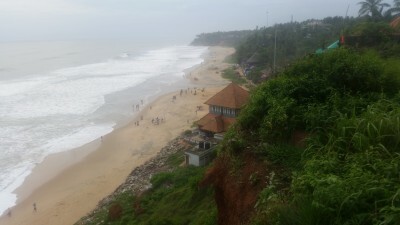 Trivandrum the capital city of Kerala has some temples you can go see. There are some nice places to eat in the city, you can get your ayurvedic massage. Not for the faint hearted! haha. There are the infamous backwaters which are just beautiful. After a week of working it was awesome to head up to Allepey (back waters) by train, the train journey itself is an experience. The back waters were so calm, such a contrast to the busy roads and so many people! You get to see people living by the river’s edge, diving and fishing with their bare hands. I also took a trip to a little hippy town called Varkhala, it is by the coast, the beach is not suitable for swimming but it is an amazing place to go spend the day. Lots of things going on, kids playing, other travellers. There are plenty places to eat. You can rent scooters and explore as far as you want as well. My most favourite place to visit on my travels was a place called Kumily in the Western Ghats mountain region. A different world. There were jungle treks, jeep safari, local chocolate factory! They grow a lot of tea amongst other things in the mountainous regions. Whichever place I went there were opportunities to meet other travellers or western people, some places less so then others but I think that is what made the experience. The practice of medicine in Tanzania is very different to our own. 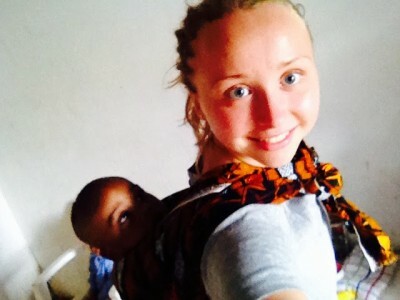 Kasia’s awesome blog really highlights the differences in nursing practices in Tanzania where facilities are limited and treatments rationed according to the patient’s ability to pay. 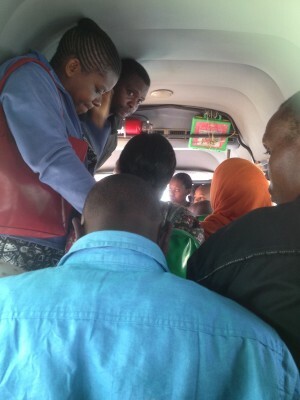 My first ride on the Dala Dala to placement was not as bad as I thought, although I felt bad for the man who had a rather plump lady sat next to (or rather on top of) him due to the drivers cramming in passengers like a tin of sardines. Arriving into the hospital the first thing you notice is the large sign saying what forms of payment are accepted! My first stop would be paediatrics. On entry to the ward I had no idea what to expect. The ward staff did not check my ID, showed me where to get changed (an old disused patient room) and were happy for me to just sit with the doctor listening in on consultations. The doctor reviewed all the patients in the morning, with the mum and child going to the doctor for this. No equipment was cleaned between patients, nor hands (there were signs in Tanzanian showing thorough hand washing, however the hand gel had run out and there were no towels to dry hands with either! ), yet nobody was allowed to walk on the floor whilst it was being cleaned!! A bizarre experience coming from a busy children’s ward in England where patient care is first and foremost – the nurses in West Meru ate lunch before doing IV medications which were due and although due to a language barrier I did not understand the specifics of what they said to mothers who approached them whilst on lunch, I did observe they did not move to speak to them or pause having lunch. I helped the nurse with a child who’d had a burn covering almost 1/2 their body. The water was first sterilised by boiling it, however cold water was then added which completely defeats the object of sterilisation. The child was placed in a tub of this water to soak the skin. For the gauze, the nurse had to go to another department as it was not kept in the paediatric ward. Wearing gloves, the nurse began rubbing the child’s skin to clean it and remove dead skin. I offered to hold the child as I could see that mum was very distressed also, however the nurse shook her head at this. The child was crying. She hadn’t received any pain relief prior to this. The nurse used a razor blade to cut off large amounts of dead skin, however there had been no incisions made to prevent compartment syndrome occurring and the blade was not sterilised. Mum was comforting the child by rubbing their arm (the badly burned one) – I tried to explain to mum to rub the other arm as she could introduce infection to the open wounds as I had not witnessed anyone else informing her of this. After a while, Mum walked off almost crying with her baby. The nurse didn’t look finished with the wounds however I think it had been too much for both mum and baby. After the debriding the nurse applied silver nitrate cream to the burned areas and Mum gave some paracetamol and ibuprofen to her baby which she’d had to bring from home along with the creams. Walking to get the gauze we saw a man whose hand was dripping with blood. The nurse guided him to minor theatres. Despite the depth of the wound on his hand and proximity to the bone, no X-rays were done. Pain relief was not given immediately from what I saw, however I left soon after his arrival. After this I helped with some observations on a baby who had stopped feeding. They were having IV medications administered as an injection. There were unsheathed needles scattered across the desk and no sharps bins or clinical waste bins. I could not take the baby’s blood glucose level as although there was a meter, there were no testing strips to use with it. After this I headed back to USA river on the Dala dala to the nursery which helps mums to go to work by looking after their children, charging them in relation to their salary. 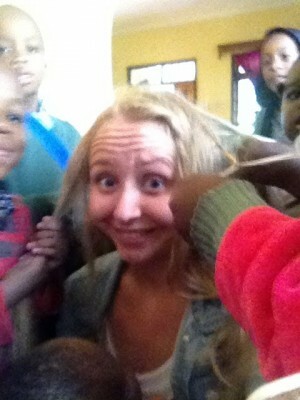 The children were at first obsessed with me, pulling my hair (which kind of hurt!!). It was difficult to tell them not to as I did not know how! I soon learned the word Acha “Stop”! After nursery I checked out the swimming pool at Green Hills Lodge. It again was freezing but I managed 1.5km!! Went to ward round in paediatrics. Child with burn still attending for daily debriding and still appears to be in pain. Left soon after ward round to go home to X-ray and see if anything was happening there. There was a lady having her ankle reset without the use of X-ray and being plaster casted without knowing the bones are in the right place for sure. 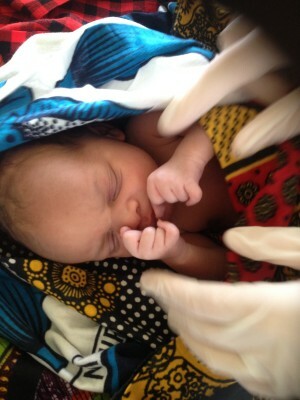 Just another day of medicine in Tanzania. Went to the nursery again today. Very hot and children still allowed outside sans hats and suncream – surely they must still burn no? In England it’s no hat, no play, no fun today! One little girl latched onto me. She is new at nursery and kept saying “lets look for mama” and kept crying. I learned “baasi, mama badaye” loosely translated to “its okay mama will be here later”, which I seemed to be saying all day, calming Charity down… then when I had to leave all hell broke loose and I couldn’t prise her off me so I had to wait another hour until she could be distracted with lunch! I then went to the river trees hotel, where there’s a pool and I was meeting some medical students from Arizona and Belgium who I had seen at the hospital. Again we braved the cold water… with the surprise of this pool having HOT showers!! Finally shampooed AND conditioned my hair! Walking there it was loud with a tapping sound in the drains, Joshua told me it was frogs – I looked to see loads of big frogs croaking away! Crazy how the sound just filled the streets! I went to a local orphanage in the morning then to a Masai market in town in the afternoon and out with some medical students in the evening to what I was told was one of the best bars in Arusha for foreigners – The Empire. 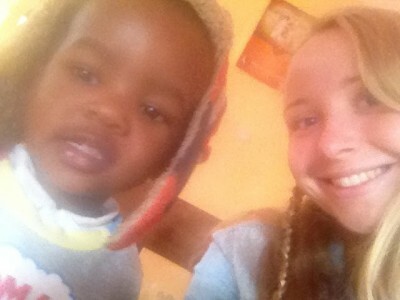 At the orphanage I helped with breakfast then was left to look after 6 under 3 year olds alone! Hell! They were not allowed to play outside but the door had no lock and I had no way of keeping them in, plus it seemed it was potty time every ten minutes which was a trip outside with all of them who after would run in different directions and not listen to my telling them to come inside even though I knew they were understanding my Swahili. I tried to occupy them with colouring, but no matter how many colouring pencils each child had they still wanted the ones the others had, and would hit, bite, scratch and attempt to strangle one another to get them and this always ended in tears. I felt like screaming with them at times! It was difficult to keep them entertained for any period of time because like most two-three year olds they got bored quickly and there were no toys other than a tennis ball! I managed to escape around 12 as after 4 hours I was exhausted. After I got the dala dala to Arusha to go to the Masai market where I literally was pulled from shop to shop to try and get me to buy things… Ended up buying 3 pairs of harem trousers at 15000TSh each (about £5). 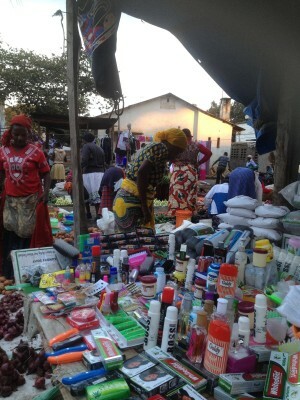 It was hard bargaining as most shop owners started at 40,000 Tsh for these! After a few hours I finally managed to escape and found a guy selling fruit salads for 2000 TSH! Like a whole plate full and the fruit here tastes so much fresher! If it wasn’t a risk for smushing all over my suitcase I’d be tempted to smuggle a watermelon home!!! Got home just before dusk and had a few hours before going back out again. Spent some time with Lillian, Beatrice’s daughter, who is the same age as me but still in high school. She’s been off school sick but goes back on Sunday until December! Apparently even at 21 she has to have permission to go home and see her parents?! And parents aren’t usually allowed to visit!! Lillian asked me about my birthday – I had gone ice skating which she hadn’t heard of! I showed her some YouTube videos which her reaction to was amazing! She was in disbelief at how people can balance!! Peter, the taxi driver arrived and took me to Arusha, charging 40,000 for what I later learned was a 20,000 tsh trip!!!! Still not as bad as UK taxis though. Got to the bar and spent the night dancing and singing with the other hospital volunteers and orphanage volunteers. Home by 3am ears ringing and desperate to go to bed but met some cool and some “interesting” people! I’m writing this from the dala dala hence typos! 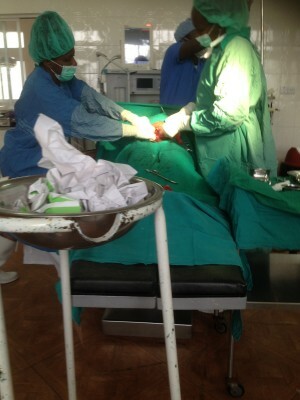 Just been to Meru District Hospital and spent some time in major theatres! Finally one place which has handwash and running water! A lady came in for “emergency” c-section… There was meconium stained amniotic fluid and the baby’s heart rate was dropping. From making the assessment of the baby being in distress and getting the baby out it took thirty minutes! I watched the c-section – with the whole procedure much less dignified than in the UK. The sterile field was small, and the woman lying naked completely uncovered (in the maternity ward too there was a whole bay of women lying naked with no curtains between – a stark contrast to British culture!). When the incision was made, the skin was then stretched to prevent making a larger incision and then after one more incision, the baby’s head became visible and lots of meconium stained fluid came out. The umbilical cord was wrapped around its neck. This was unwrapped quickly and the baby’s mouth cleared of the meconium fluid to prevent aspiration. Within minutes the baby started crying – a good sign!!! Mum saw her baby girl briefly before the baby was taken back (I got to carry her!!) to the maternity ward to be weighed and warmed up using a heat lamp as she was shivering. For the surgery the mum had just received fluids and an epidural! She began complaining of pain however the nurses said she would have to wait to go to maternity as they do not administer the pain relief in theatre as they don’t keep the injections! On return to maternity about 45 minutes later she would receive basically a weaker form of morphine, pethidine. After this I went to the orphanage/nursery via the pharmacy to get cream for my mosquito bites 🙁 when I got there the children were all asleep!!! It was bliss! They woke up one by one and the routine starts – potties, feeding and then all hell breaks loose! Luckily today there was someone else helping me 🙂 still, when the older (5-7yr) children finished school and came back they were fighting over my hair and god knows how I will get all these mattes out!! Maybe I will get dreadlocks after all! After 4 or so hours I decided it was me time and went for my first run since arriving. The roads are rocky so it was difficult to keep grip, and since Tanzanians on the whole do not seem to be as into keeping active as us westerners, I got a few odd looks and people humouring me pretending to run alongside and others clapping. Overall it was a good run, exploring new places and finding a cute little stream tucked away behind the houses. And another day flown by! Another day at the hospital – got there and there was a large police presence – the senator was in town meaning the whole hospital came to a standstill!! After the speech was finished I was hoping to spend another day in major theatres however they had no planned surgeries. Instead I followed an American trainee advanced nurse practitioner around maternity and together we did ward round assessing the women who had given birth and their babies in the postpartum ward! I mainly took on the assessment of the newborn role (as the nurse practitioner, Tess, was not specifically paeds trained) and then just helped with manual BPs (automatic machine was broken) for the Mums. Three of the babies had low temperatures (below 35) however only two were dehydrated, both with sunken fontanelle and one difficult to rouse with a heart rate of 120bm. It was frustrating as there was no glucometer on the ward and no glucose to give the babies! The only thing we could do was encourage the mums to feed more! 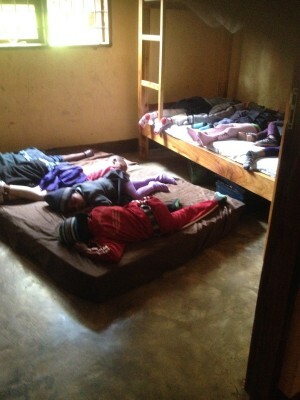 One more thing to mention is that most beds were occupied by 2-3 women!! Some only 1 though, for example a woman 1 hour post c-section who was still haemorrhaging and experiencing rigors. 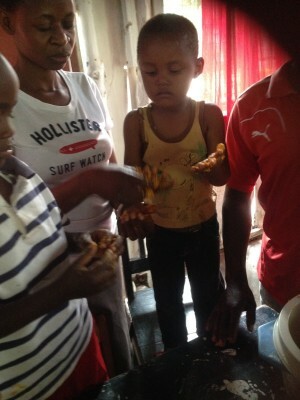 At 2pm it was time to go and help at the orphanage. I decided to stop en route to get my side braids redone with rasta… I thought 10,000 tsh was cheap so I tipped 5,000 however apparently it should only have cost me 3,000!! Still 15,000 is only £5 which I’m happy with!! At the nursery again the children were asleep. This time when they woke up I decided to use technology and put into practice a few phrases I have learned “mtoto/watoto turia” – “child/ren behave” and “cheza visuri” – “play nicely”. Using my phone I showed them (and attempted to teach them) the song Hakuna Matata since the phrase is actually swahili for “no worries” as the song says. This kept most of them happy for almost one hour. When the battery was about to die however it was time to leave for swahili lessons anyway!! After the lesson I went running and en route popped to a shop. Within 5 minutes it was almost pitch black and so the run home along jagged rocky roads was interesting to say the least!! Time to get some sleep for the day ahead. Today I went with a tour guide and Mary (our swahili teacher who decided to tag along) to the hot springs. It was a two hour drive along very rocky and bumpy roads where you could barely drive 15mph. The journey was interesting with Masai men walking with donkeys carrying water and we saw them herding goats and sheep as well. The springs were in the midst of barren desert like farmland (with baobob, acacia and cactus trees sparsely scattered alongside aloe vera plants), and was surprising to find in such terrain. The water was warm ish, around 32 degrees celsius, with lots of the fish that used to be kept in tanks in the UK for eating the dead skin off your feet. If you stayed still too long (by sitting on one of the rocks for example as the water was too deep to stand) the fish would come and start nibbling so it was best to keep moving. I stayed in the water for a few hours, chatting to other British tourists and intermittently having a go on the swing over the water which took me a few attempts before I could actually jump!! First time was a disaster because I forgot to hold my nose and not breathe underwater so I felt as though I was going to drown. I explored through the narrow gap in a row of trees lining a narrower stretch of the spring and found the lagoon where the source of the spring was – looking into the water there was a really deep hole in the sandy bed of the lagoon! Apparently it would be dangerous to swim down there as it is quicksand in the hole from what I understood. We left around 2:30pm, after checking out the turtles/tortoise? in the shallow stream behind the shack like bar at the springs… I had no idea Tanzanian waters had turtles/tortoise?. On the way back we stopped at the petrol station where there was a coffee place… It was amazing to have a coffee after a whole week of not one!!! Even if the cup was leaky. When back in Usa river I went for a mooch around the market then home. Beatrice had organised to go out for dinner. The place had a buffet with some suspicious looking things so I got Joshua to check everything to make sure it was not meat!!! Still a stray piece of beef landed on my plate which left me paranoid for the rest of the meal and since it was dark in the room to eat I just had to double check it using my phone torch. Must’ve looked like a right nutter, but I think Beatrice understood (as I almost cried this morning when I saw they had bought chickens from the market which were not going to be used for eggs and were still alive…) So she got her phone torch out and double checked too!! And that is it up to now…. Bed time again at last!! 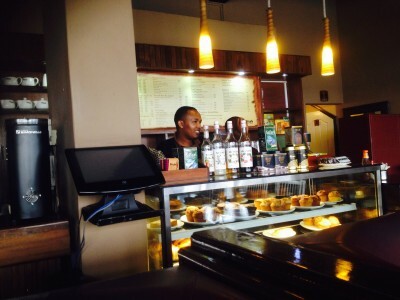 Went to Arusha today to go to Africafe and get good coffee and wifi… ended up having “Hot Stepper” – a ginger, lemon and honey drink which really was “hot”. Sat there updating this blog for a few hours then walked to central market around mid dayAfter this I walked back to Africafe, stumbling upon an Asian supermarket on the way where I found Cadburys Bourneville dark chocolate! The only dark chocolate I’ve found in Arusha so far!!! I also bought soya milk and when desperate times call for desperate measures I went back to the cafe and ordered a soya cappuccino with my soya milk! 😀 Happy days. After lunch I went go the palace hotel gym on the tenth floor overlooking mount meru – stunning but forgot to take a picture. After a lot of sweating and a good lukewarm (yay not Baltic Sea cold) shower I headed back to the dala dala. I walked back to the house once in USA river and dropped my bags. Nobody was home but I heard a noise. I looked behind and the chickens had followed me into the house. I shooed them out then went to change my shoes… They had followed me back in!! Shooed them out again and locked up. Went to the market in USA, with the usual walk involving the children across the road coming to hug me, where I bought some hoodies since I left my only one at the bar the other night accidentally. Got to the hospital today just in time to see another c-section! After this I went to paediatric ward round where again it is much of the same – pneumonia and burns! After the hospital I went to the nursery which helps by looking after children so the mothers can go to work. 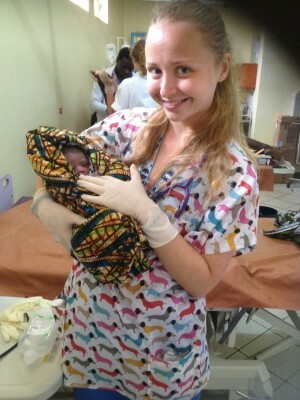 I learned how to carry babies African style today!!! Actually is quite easy once they’re on your back!! Planned with the owner to make an outdoors mud kitchen for messy play like in England as this will be relatively inexpensive! Will also at some point show them how to make play dough…. But in the recipe it says you have to put in fridge which I’m unsure as to whether they have. I helped feed the children lunch (they offered me some but the lump of white corn maize flour stuff just doesn’t look all that edible!) then left to go swimming at the nearby hotel before having a Swahili lesson. Been to the hospital today and although today is the day for planned surgeries there were none so I went to maternity instead as it’s much busier than paeds and still I get experience with care of newborns (or how not to act) and vital signs. Saw two babies born today! Again very different I’ve been told from European practice since the birth rate per woman in Tanzania is almost three times that of the UK… And there is a shortage of beds for women in labour… So if the baby isn’t ready to drop out then there’s “no bed for you”… And if the Baby is coming too slowly or isn’t out in a few pushes… There’s no patience… They are much more inclined to make cuts.. Which was rather gruesome (don’t read on if you’re squeamish) with the scissors being blunt and not sterile so acting more as pliers to rip the woman with, and the midwife trying again to cut the woman when the next push (although the baby progressed closer to being out) didn’t result in the baby being delivered. When the baby was born it was wiped down, weighed and swaddled and left on the table while the mum was being stitched up… So I picked the baby up because it was crying and nobody was taking notice… I showed mum her baby but was not allowed to put the baby on the mother as is encouraged in UK. And here I’ve yet to see any skin to skin practice plus mums don’t get their babies to hold for up to two hours post delivery…Which inevitably results in delays in milk production and more difficulties for some… With some newborns becoming very cold and lethargic very quickly… I couldn’t say for sure whether this was due to low blood glucose as the meter to measure this is broken and there is no spare. As a precaution for a few babies who were <34 degrees Celsius and not flexing to pain, we gave 10ml of 10% glucose fluid (as that was all which was available) and held them near a heat lamp and hoped for the best. Nobody seemed at all concerned about the baby’s clenched fists and overlapping fingers distinctive of a syndrome such as Trisomy 18. An eye opening experience as to potential reasons why the newborn death rate is higher in countries such as Tanzania compared to Western countries. After the second birth I left to go to the nursery. I played ball with the children and one of the Nannies outside, managing to pass Charity (the little girl who every day cries for her Mum and latches onto me to pick her up) to Abel, a man who works within the nursery… I pointed at Abel and said “Baba” (dad) and Charity latched onto him surprisingly well, with him even having to sit her in the minibus whilst it was cleaned. It was quite comical. Just as I got to the hospital today there was a baby who had just been resuscitated after stopping breathing during delivery! Amazing. I went round the postpartum ward helping with taking vital signs of mum and baby… Lots of mums had high pulse rates due to pain, however if they didn’t have the money they could not get pain relief! One mum had a history of pregnancy induced hypertension… Her BP was slightly elevated at 145 systolic… However there was no baseline to compare this to!!!!! I gave her an IM injection of Pethidene… The strangest injection I’ve given as the nurse just hands it to me and points to where without giving me chance to change gloves or wash my hands… TIA (this is Africa) has become the general saying around here. After going back round and checking all the babies reflexes, checking for spinibifida, cleft palate and other signs of abnormality I went over to the paediatric ward and helped with admissions there. On admission they try to cannulate all of the babies and children (mostly unsuccessfully resulting in IM injections of medication) and they test all of them for HIV. In the resuscitation area alone was a young (possibly 1 year old) boy on humidified oxygen sat with his mum. The boy had nasal flaring, head bobbing, was using all accessory muscles and still grunting. He was trying to cry but no sound was coming out. No doctors or nurses were overseeing. The situation seemed wholly uncomfortable as if this were in UK the nurse looking after the child would most likely be there all the time, with outreach nurses being called and potential transfer to PHDU or such like. Vital signs would be taken regularly, not 6 hourly, and the child would most likely be on continuous pulse oximetry. After we had got through the admissions I went to the nursery to make play dough with the older children (4-6year olds). Then went for a short run before having a Swahili lesson to learn animal names before going on safari this weekend. Very busy second to last day in USA river. Went to the hospital in the morning to help out in the postnatal ward… Now got my manual BP skills down to a tee. All the babies today were fine – well hydrated with good reflexes. One of the mums with pre-eclampsia had a BP of 158/100… I told the doctor and he questioned “it’s too high?” to which one of the Dutch midwifery students (who had got so frustrated with the inaction on the doctors part) just told the doctor “F you” and walked off. Emotions were running high as after two weeks in a foreign hospital where you see people suffering because there is a lack of compassion and unwillingness to go the extra mile for the patient it does become mentally draining!! It’s the questions of “why go into a caring profession and not put in 100% as these are people in need!” and “how do people survive here?”. According to the doctor the literature says to recheck BP six hours apart in this time. When I asked where he got his sources from he stumbled and said references. I told him he had to understand how frustrating it is that in England people would be acting quickly, and monitoring vitals more closely when there is an anomaly, not sitting back and waiting 6 hours. I explained to him a few of the things I’d seen here and what would have happened back in the UK and he began to comprehend the major differences in the systems and perhaps why there have been differences of opinions at times – I told him I respect they don’t have so many resources, but monitoring vitals when you already have a BP cuff doesn’t cost anything. He laughed and said yes and that the blood pressure would be rechecked 2 hourly, result. There was a woman in labour crying in pain asking for a c-section because it was too painful. The nurse was shouting at her and laughing about the fact she was asking for a c-section as there was no indication (yet they did a c-section on another woman on the premise they “thought” the baby was going to be big… It was 2.7kg). No pain relief was offered and the nurse then walked away from the woman. Later on this woman was on the floor rolling in agony and going in and out of consciousness. BP and blood glucose were fine. It took 8 people to lift her (no hoists and definitely not what is taught in manual handling training) onto a wheelchair and back to the bed. The doctor concluded it was a panic attack and after ten minutes (checking foetal heart rate etc.) all hospital staff again left her alone without support, so the student midwife went over to hold her hand. I’d been able to listen to the foetal heart rate using the Doppler which is placed on the tummy. A downside of long hair is when the bun you’ve placed it in falls out at a very inconvenient time and your hair goes somewhere you really did not want it to. Go figure. After the situation had calmed down I left for the last day at the nursery. I was exhausted by this time. I spent some time sitting with the little ones. Namely Salha who unfortunately I haven’t been able to discuss her visa arrangements yet with her mother (joke). I’m going to miss that little one!!! After this I went home to pack, then swim in icy cold water. After which I went up to the hotel bar in search of coffee! Filter coffee – result! None of the crappy instant stuff. Good coffee. Back to the house to chill and watch Netflix and say goodbye to Joshua and Beatrice as tomorrow when I leave they will be out!! Early start from Meserani snake park to our next stop at Twiga Camp near Mto Wa Mbu where we would see the Masaii people. In the morning we dropped our bags and then went on a walking tour of the banana plantations (who knew there were more than 30 types of bananas?!) and the brave tried some fresh banana beer which did not look suitable for human consumption due to the layer of millet still being present. I only tested the banana wine… Which was nowhere near as nice ad it sounds!! Debating whether the “factory made” banana beers are worth 0.7kg of my luggage allowance now!! After this we went to see some tribe men carving the wooden animals which are sold at the Masai Market in Arusha town. While there we noticed there were lots of lizards (actual wild ones!). Then it was onto see the painting which is also sold. Amazing artwork but am holding fire on buying anything as currently I already have to sit on my suitcase for it to close! 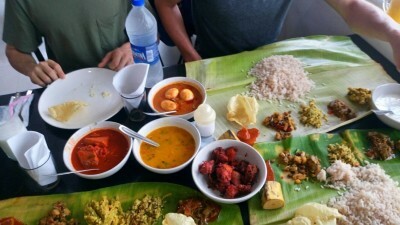 After this we went for a traditional Tanzanian lunch with all sorts of dishes (2 out of about 12 plus were NOT vegan!!) – that left spinach, cabbages and vegetables, okra, aubergine, bananas, sweet potatoes, and an extremely hot chilli sauce plus various bean dishes and sweet corn and beans called Makande. Then onto visit Mto WA Mbu where we looked at the cooking project going on which enables the Masai to have a clean cooking fuel source by teaching them to build chimneys. The Masai children were very shy and they did not like having their photos taken. There were lots of children, and the Masai women ha lots of jewellery. After this was time to go back to the camp and those of us who signed up for the mountain bike tour set off for a journey across amazing scenery to Lake Manyara where we saw lots of flamingos, Impala, gazelles and storks. On the way back I passed through the market to buy a bunch of the red bananas we had sampled earlier, which taste sweeter yet more citrusy than normal yellow bananas! On it all day as it was still not heated), then went for my first hot shower in a long time… Amazing!!! After this it was dinner time and a glass of red wine before bed which worked wonders to help me sleep! We arrived in Serengeti around 1pm on Saturday. No signal at all. At the entrance there were Masai children trying to get you to give them money in return for a photo, but we had been encouraged to promote responsible and sustainable travel and not give them anything at all. There was a cool chameleon and lizard at the main entrance when we arrived, and lots of superb starlings trying to get scraps of people’s lunches. The road the whole way was bumpy and loud, much like using a vibration plate at the gym. En route to the campsite we went on a game drive where we saw hyenas, ostrich, lions, a leopard, warthogs, elephants, gazelle, zebra, giraffes and probably more which I cannot remember! We arrived at our campsite for the night where we were warned of hyenas and not to go to the toilet block overnight unless absolutely necessary… which for me it was twice, however with the tent surrounded by hyenas one has to improvise, but what happens in Africa stays in Africa. The next day was a full day gamedrive best described by the photos to be uploaded when I’ve returned to UK. Back to the same campsite again for the night. Hyenas still audible all night, difficult to sleep! Woke up in the morning to giraffe less than 50m from the tents – amazing! The following day was a gamedrive before heading to Ngorogoro crater campsite, where the dangers in the night were buffalo. Again, no toilet trips in the night. This day we only saw cheetah! Still, amazing! Spent today at Ngorogoro crater… freezing!! Saw lots of zebra, buffalo, wildebeest, warthogs, lions, jackal and vervet monkeys. Not much more to say. Back at Meserani snake park by 3pm. Not feeling too great after the long journey so headed for a walk and then to bed!